The catalog spreadsheet is the quintessence of the FOTOCAT archive. Our last count amounts to 11,900 cases; it is permanently increasing in number and improving in data quality. In the study of UFO phenomena there are several topics that emerge as key issues for the understanding and potential resolution of this worldwide enigma. The subject of UFO waves and UFO flaps is, evidently, one of these. 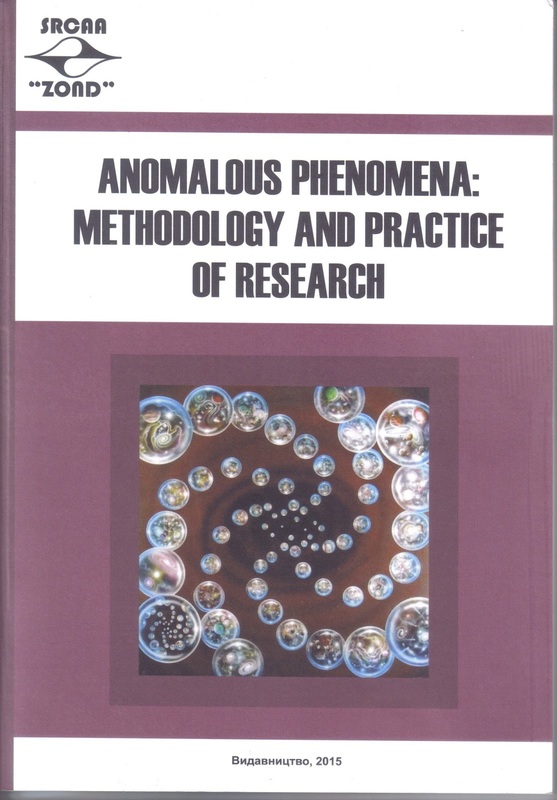 Compiling bibliographies of research items has been a recurrent interest in my investigative life, as I have always thought that, as in mainstream science disciplines, progress is linked to the knowledge of prior work in the field. Those who ignore what their senior colleagues have produced on a given matter waste time duplicating past efforts or are unable to build upon previous finds. Over the years, the field of ufology has produced many authoritative bibliographies. With a few exceptions, these are general lists of literature, sometimes annotated, but usually not organized by topic. Nevertheless, these assist the researcher and represent an academic advancement. As I am committed to the concept of achieving a synthesis of knowledge in some of the main areas of the study of UFOs, I think a more pragmatic approach is to design a series of very specific, subject-focused bibliographies. As a practical example, I have combed through my files to create a thorough bibliography of articles and papers related to the mystery of UFO waves, those periods when UFO reporting increases noticeably and suddenly with respect to average historical records. I have been assisted by a number of top scholars who have contributed references, actual materials, pdfs and online links to create what is intended to be a comprehensive list of the literature on this subject published all over the world. 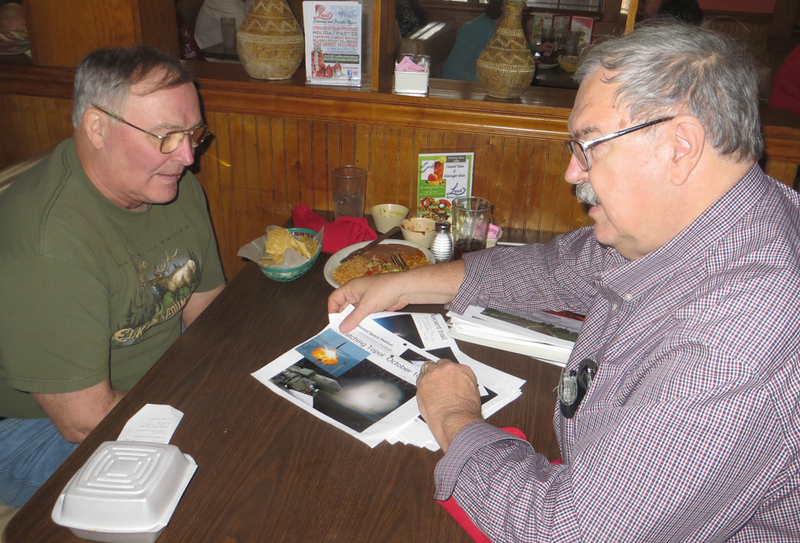 It is a fact that, over the years, different UFO researchers have been working in the same areas without each other’s knowledge, sharing common interests, motivations and objectives. 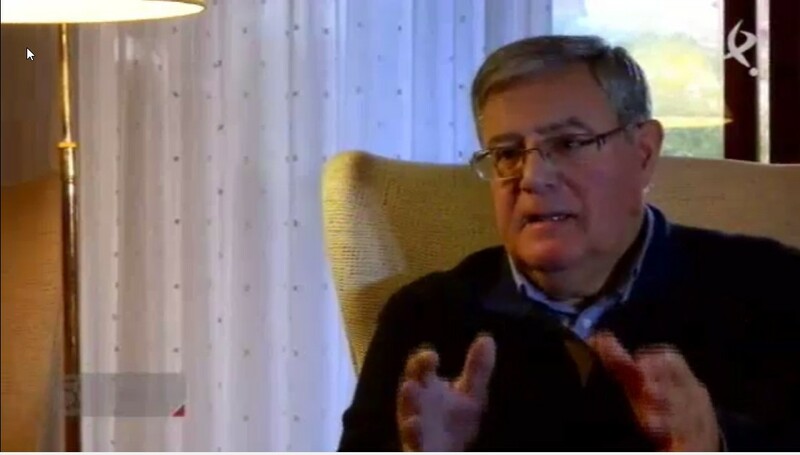 One example is Edoardo Russo, leader of the Italian Center for UFO Studies (CISU), who compiled a rather extensive bibliography on this same theme in 2005. Mr. Russo has been very generous in ceding all the data he collected to the current bibliography. Another researcher that has kept a meticulous thematic register of UFO papers is French scholar Claude Maugé. Thanks to his open collaboration, I have consolidated his records into the present bibliography as well. The material here presented ranges from initial ideas and informal conjectures to articulated statistical work and formal studies on the shaping and development of waves and their relation to external factors, and on the existence of any periodicity or temporal pattern within. Major books and monographs focusing on specific wave periods all over the world have also been included. I have listed the bibliography by chronological order of publication. By doing so, I want to give a sense of history of the progress of ufology, adding a temporal flavor to it: who first stated this or discovered that. There is one aspect I have purposely avoided in this compendium. That is the robust research conducted to prove or disprove the relationship between the rise of UFO reports and geophysical variables such as faults (first suggested in France by Fernand Lagarde) or seismic activity, the so-called Tectonic Strain Hypothesis (first proposed in Canada by Dr. Michael A. Persinger). Although these factors might also influence levels of UFO reporting (i.e. waves), I have excluded the ample existing literature on the basis that this distinct line of inquiry in the field of geophysics merits a systematic bibliography of its own. The literature of sociology and popular culture amply covers episodes of mass delusion, war fears, short-term collective hysteria and the like. I have excluded these related topics from the present bibliography unless there is a direct relationship to alleged accounts of the apparition of unusual aerial vessels, flying machines or aircraft. I have also excluded any articles proposing, investigating or refuting the theory of “orthoteny.” Although those alignments were first discovered in data of the 1954 wave in France, similar straight-line patterns have claimed to be found elsewhere. Whether this is simply a pure statistical artifact or not, it cannot be considered relevant to flap periods. This bibliography is not an end in itself. My main goal is to encourage UFO students in academia to analyze the problem of these reporting surges with a view to interpreting and modelling the underlying mechanisms that generate them. The response to this question will enlighten us as to the nature of UFO phenomena. To this purpose, I have striven to facilitate, when existing or known to this compiler, online sources where the reader can consult or download the actual essays. I have also indicated with a ℗ sign when the author owns the paper in a .pdf format. For a number of books and monographs I have provided publisher information. Moreover, when I have found a given book (at least temporarily) available from Amazon, I have added the proper link. Likewise, when a work is devoted to a very particular wave and the title does not disclose its timeframe, I have included the wave date in brackets, following the item’s heading. Selection has proved to be tough when deciding between countless magazine or journal articles devoted to episodes from UFO wave periods, or when having to extract material from others’ input. Especially when many articles are written discussing a wave on either skeptical or believer grounds (e.g. the 1989-1992 wave in Belgium.) The basic premise in order to allocate a reference here is that it has to give quantified data on a flap, an overview of a wave (start, unfolding and termination) or an insight into causes and antecedents to its development, not merely a series of stories and anecdotes or case studies. This has proved difficult to ascertain when the actual article is not at hand to read so I followed the principle that too much is better than too little. If there are items not fulfilling such requirements, any new edition will clean them up. The bottom line in selecting an optimal item is that it is crucial for the understanding of a given UFO wave, as well as any work that investigates the statistics of a wave, or sets forth any theory on periodicities or cycles discovered within a longer period where several waves have occurred. I am inviting fellow researchers to report any mistakes and to supply any references I may have missed. I am also requesting readers to provide any links to works already included here that are available on the internet. Finally, I would appreciate any contributions of pdfs of essays (already cited or new), in order to complement an archive that before long will be shared with everybody through a dropbox-type system. (1) Highlighting the importance of much research work made in Europe in the early decades of UFO publications, which were neglected or ignored by English-speaking ufologists, and, therefore, never verified, tested or improved. (2) Calling for an intelligent synthesis that firstly summarizes all finds and secondly concentrates the accumulated knowledge of this problem so far, which is a much-needed step before we can carry out a global analysis of the underlying causes of the wave phenomenon. To this objective, and after this publication, I will encourage the formation of an ad hoc taskforce of volunteers to study the collected materials, which will be the object of a separate communication. Finally, this essay serves to pay a heartfelt tribute to the pioneering and painstaking work carried out by many scholars, some of them unheard by later generations. “Les Essais de Missiles de la Marine U.S. et les Observations d’OVNI aux Isles Canaries,” La Gazette Fortéenne, Volume I, August 2002, pages 229-246. “Navy Missiles Tests and the Canary Islands UFOs,” International UFO Reporter, Volume 29, Number 4, July 2005, cover, pages 3-9 and 26. In the search for patterns of the UFO phenomenon, the relationship of sightings to population density has historically shown contradictory results. After more than 40 years of studies, there is not yet a clear conclusion on whether the relationship between the number of reports and population density is direct or inverse. We have reviewed some of these works and found out how to reconcile all of them. We found that there is a direct relationship between the number of sightings and population density; however, the increase in number of reports is not proportional but sub- lineal with respect to the increase in population. Since 1966, when Jacques Vallee published results establishing an inverse relation between landing sites and population density in France, many other tests have been performed to check those findings and to attempt to resolve the question. Plaza has carried out an extensive review of the international literature in this field up to 2014 and arrives at the conclusion that, contrary to the original findings, it points to an increase in the number of UFO reports in line with population. This is a sub-linear relationship, that is, there are some other specific factors in place that reduce such proportionality. Works like this not only illustrate that mainstream science can perfectly tackle the study of UFO data but that to this purpose, well organized, highly representative databanks are essential. 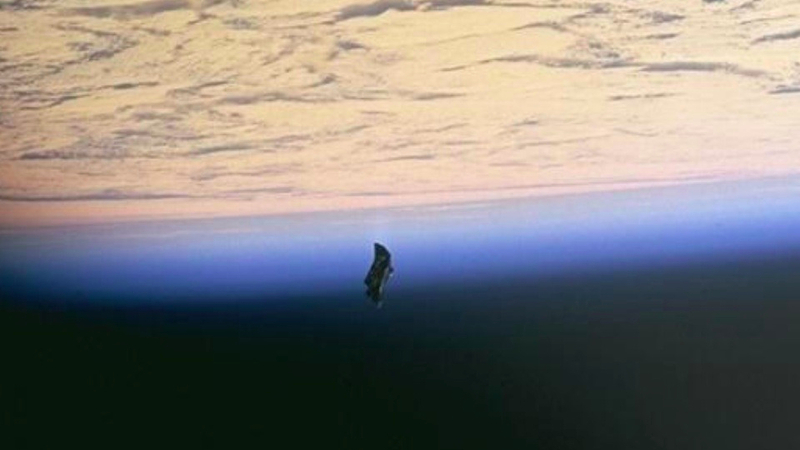 The bottom line here is that this object photographed from the STS-88 mission (December 3 to 15, 1998) is a spacecraft insulation blanket accidentally dropped by astronaut Jerry L. Ross during an extra-vehicular activity. This piece, one of six installed on the first segment of the future International Space Station, burned up in a few days (it was replaced on the next mission.) Below, ex-astronaut Ross (on the left) meets Oberg. 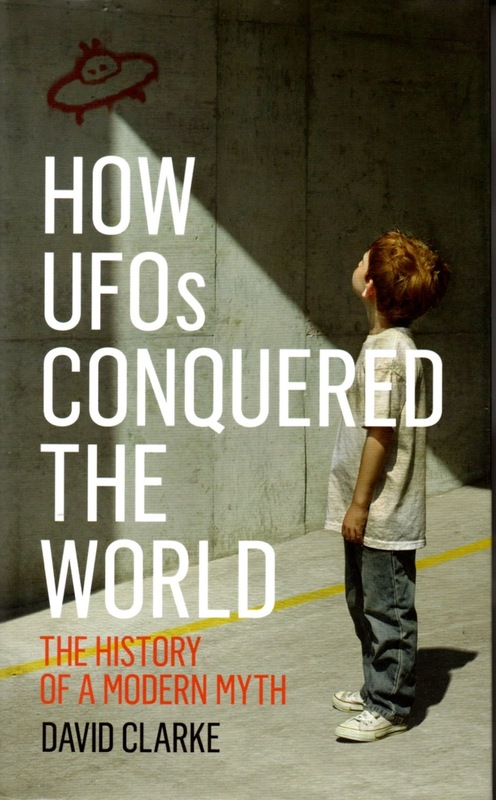 (1) there is no such thing as ‘the UFO phenomenon’, but lots of phenomena that cause UFOs, (2) there is no such thing as a ‘true UFO’, (3) extraordinary claims require extraordinary evidence, (4) accounts of UFO experiences form the core of the syndrome, but stories do not constitute ‘evidence’ but folklore, (5) Culture –not experience‒ creates the UFO interpretation but some experiences are independent of culture, (6) the UFO syndrome fulfils the role of the supernatural ‘other’, (7) the extraterrestrial hypothesis and other exotic theories cannot explain UFOs, (8) the idea of a super-conspiracy to hide the truth about UFOs is unfalsifiable, (9) the common denominator in UFO stories is the human beings who see and believe in them, and (10) people want to believe in UFOs. Here is when someone murmurs Amen or just stands up and claps his hands. The book contains a preface plus 17 papers, by 14 main authors, 8 from Ukraine, 2 from Russia, 3 from Europe (Spain, Austria and Netherlands) and 1 from the USA. The text is in English (seven papers) and Ukrainian (ten papers) with abstracts in both languages. [It includes my article “The Future of Ufology”]. La hoja de cálculo que soporta el catálogo es la quintaesencia de los archivos FOTOCAT. El último cómputo arroja un total de 11.900 casos y sigue permanentemente creciendo en número y en calidad. Existen varios temas que son claves en el estudio del fenómeno OVNI, si buscamos entender y potencialmente resolver este enigma mundial. Uno de ellos es, evidentemente, el estudio de las oleadas OVNI. Uno de los intereses recurrentes a lo largo de mi vida como investigador ha sido la recopilación de bibliografías sobre trabajos de investigación, pues siempre he pensado que, como ocurre en las disciplinas científicas formales, todo progreso está vinculado a conocer bien lo que se ha descubierto sobre esa materia con anterioridad. Aquellos que ignoran lo que sus predecesores han alcanzado en cualquier campo, pierden mucho tiempo duplicando lo que ya se ha realizado o son incapaces de avanzar sobre los hallazgos previos. En el transcurso de los años, la ufología ha producido muchas bibliografías de calidad. Con unas pocas excepciones, habitualmente se centran en la literatura generalista producida. A veces están comentadas, pero no organizadas por temas. Aun así, las mismas resultan de utilidad al investigador y representan un avance académico. Como uno de los objetivos en los que estoy más comprometido es alcanzar una síntesis de conocimientos en algunas de las principales áreas de estudio de los OVNIS, creo necesario un enfoque más pragmático, como el que podría ser el diseño de una serie de bibliografías muy específicas, centradas en temas concretos. A modo de ejemplo práctico, he revisado mis archivos para elaborar una bibliografía exhaustiva de todos aquellos artículos y trabajos relativos al misterio de las oleadas OVNI, aquellos períodos en que los informes OVNI aumentan de forma súbita y notable con respecto de los promedios históricos. En esta labor me han asistido muchos destacados estudiosos que han aportado referencias, documentos, pdfs y enlaces online para crear lo que pretendo sea una lista exhaustiva de toda la literatura publicada en el mundo sobre este particular. Es un hecho que, en el curso de los años, muchos ufólogos han trabajado en los mismos temas de forma independiente (a menudo, sin saberlo), compartiendo intereses, motivaciones y objetivos comunes. Por ejemplo, Edoardo Russo, alma mater del Centro Italiano de Estudio de los OVNIS (CISU), que ya realizó una amplia bibliografía sobre este mismo tema en 2005. Muy generosamente, Russo ha cedido para este trabajo toda su labor realizada entonces. Otro investigador que ha mantenido un meticuloso registro temático de trabajos OVNI es el erudito francés Claude Maugé. Gracias a su colaboración sin cortapisas, sus archivos han quedado también incorporados a la presente bibliografía. El material aquí recopilado va desde meras ideas iniciales y conjeturas informales hasta los más elaborados trabajos estadísticos y estudios formales sobre el nacimiento y desarrollo de las oleadas, su relación con factores externos y la búsqueda de cualquier periodicidad o patrón temporal en las mismas. Asimismo, se incluyen todos aquellos libros y monografías publicados en torno a oleadas OVNI específicas ocurridas en cualquier rincón del mundo. He decidido presentar esta bibliografía en orden cronológico de publicación. Haciéndolo de esta forma, quiero ofrecer una historia del progreso ufológico, añadiendo un componente temporal al mismo y determinar, en su caso, quién fue el primero en afirmar esto, descubrir aquello o proponer una cierta metodología. No obstante, existe un aspecto que he descartado a propósito en este trabajo. Se trata de toda la concienzuda investigación realizada desde hace décadas para demostrar o descartar la relación existente entre la génesis de los informes de avistamientos OVNI y algunas variables geofísicas, tales como las fallas geológicas (el francés Fernand Lagarde fue el primero en sugerir esta posibilidad) o la actividad sísmica, la llamada Hipótesis de la Tensión Tectónica (el canadiense Dr. Michael A. Persinger ha sido el pionero en este campo). Aunque estos factores podrían influenciar los niveles de denuncia (o sea, crear oleadas), he decidido excluir la abundante literatura existente al respecto porque considero que esta línea de investigación en el campo de la geofísica es merecedora de una bibliografía sistemática para ella sola. La literatura sobre sociología de la cultura popular cubre en abundancia aspectos de alucinaciones en masa, temores bélicos, episodios breves de histeria colectiva y similar. Salvo que exista una relación directa con relatos de apariciones de naves aéreas, máquinas voladoras o aviones inusuales de cualquier tipo, he optado también por excluir dichos temas de esta bibliografía. También se han excluido todos los artículos o trabajos proponiendo, analizando o refutando la teoría de las “ortotenias”. Aunque estas alineaciones fueron descubiertas en los primeros análisis de datos de la oleada francesa de 1954, pronto semejantes patrones en forma de línea recta se hallaron en otros lugares y fechas. Sean o no un simple espejismo estadístico, no lo considero un tema relevante para el análisis de las oleadas. La presente bibliografía no es un fin en sí misma. Su objetivo principal es animar a los estudiosos más académicos de los OVNIS a analizar el problema de éstos súbitos incrementos de casos, con la vista puesta en interpretar y modelizar los mecanismos subyacentes que los generan. La respuesta a esta cuestión nos iluminará en gran medida en cuanto a la naturaleza del fenómeno OVNI. Para ello, he prestado particular atención a todas las fuentes online disponibles (o conocidas por este autor) para que el lector pueda consultarlas o descargarse los archivos correspondientes. Asimismo, he indicado con el símbolo ℗ aquellos trabajos de los que dispongo de copia en formato .pdf. En el caso de ciertos libros y monografías, he incluido información sobre sus editores. También he añadido el pertinente enlace si el libro figura (al menos temporalmente) incluido en las existencias de Amazon. Finalmente, cuando algún trabajo se centra en una oleada en particular y su título no lo revela de forma clara, he añadido entre corchetes la fecha de dicha oleada detrás del título. La selección de material ha resultado complicada cuando me enfrentaba a los incontables artículos de revistas especializadas centrados en episodios ocurridos durante una oleada, o a la hora de escoger las debidas referencias de listados de fuentes aportados por terceros. Especialmente, cuando se trata de innumerables artículos que discuten los fundamentos de una oleada, tanto desde posiciones escépticas como crédulas (por ejemplo, en el caso de la oleada belga de 1989-1992). La pauta básica escogida para validar una referencia es si ofrecía datos cuantitativos sobre una oleada, una visión de conjunto (comienzo, desarrollo y final) o alguna aportación valiosa sobre las causas y antecedentes de la misma, pero no si se limitaba a relatar casos o avistamientos concretos. En ocasiones, este aspecto resulta difícil de determinar cuando no se dispone del trabajo en cuestión, por ello, en caso de duda, he preferido pecar por exceso que por defecto. En una futura re-edición podrán descartarse aquellas entradas que no satisfagan los requisitos anteriores. El elemento clave para seleccionar una referencia óptima es que la misma sea crucial para el entendimiento de una oleada OVNI concreta, así como cualquier trabajo que investigue las estadísticas de una oleada, o presente cualquier teoría sobre periodicidades o ciclos descubiertos en largos periodos de tiempo durante los cuales se hayan dado varias oleadas. Quiero invitar desde aquí a todos los colegas investigadores para que me informen sin reservas sobre cualquier error y me faciliten cualquier referencia que se me haya pasado por alto. También solicito a los lectores que aporten enlaces de internet a trabajos ya incluidos aquí. Por último, agradeceré me hagan llegar cualquier pdf de ensayos (estén ya citados o no), a fin de completar un archivo que deseo compartir con todos próximamente mediante algún sistema electrónico de descarga. (1) Remarcar la importancia del abundante trabajo de investigación realizado en Europa en las primeras décadas del fenómeno, cuya publicación resultó desconocida o ignorada por los ufólogos de habla inglesa y, por consiguiente, nunca fue verificado, evaluado o mejorado. (2) Alcanzar una síntesis inteligente de lo acumulado hasta el momento, resumiendo todos los hallazgos ya realizados y concentrando todos los conocimientos disponibles, como paso previo imprescindible para poder realizar un análisis global de las causas subyacentes en el fenómeno de las oleadas. Para ello, y tras la publicación de la presente bibliografía, propondré la creación de un equipo ad hoc de voluntarios que estudien el material recopilado, lo que será objeto de una siguiente comunicación. Para finalizar, considero que este trabajo debe servir para pagar un sentido tributo al duro trabajo de todos esos pioneros, muchos de ellos desconocidos para las generaciones posteriores. Esta larga pero necesaria introducción viene a cuento a raíz de una gestión que acaba de hacerse y que es muy reveladora porque demuestra que la atención del Ejército del Aire hacia los ciudadanos que solicitan información directa o indirectamente relacionada con los ovnis es abierta, transparente y eficaz, como comprobaremos seguidamente. En el trabajo citado inmediatamente antes hice hincapié en el que Mando Operativo Aéreo (MOA) buscó archivos de casos ovni en base a listas de avistamientos que yo les facilitaba. Bastantes de esos avistamientos eran más que presuntos (y probablemente apócrifos), pues procedían de artículos o fuentes sin verificar. Pero aún así, en mi opinión, había que rastrearlos. Una de las observaciones era de la un supuesto “objeto discoidal perseguido por un caza F-4 cerca de Port de la Selva (Gerona)” ocurrida el 18 de abril de 1977. 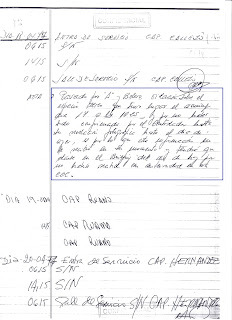 A la vista de la orden de búsqueda de datos realizada por el general jefe del MOA, en noviembre de 1992 el Grupo Central de Mando y Control (GRUCEMAC), la unidad que centraliza la información de detecciones radar y el envío de aviones en misión de interceptación, contestó adjuntando la hoja correspondiente de los libros de registro. Allí no aparece vestigio alguno que confirme un scramble ese día en Cataluña. Lo que si hay es una anotación sobre una violación de espacio aéreo del día anterior, hecho que no es infrecuente y que no tiene nada que ver con los ovnis. Pero que hemos querido usar para satisfacer nuestra natural curiosidad, primero, y para comprobar la reacción de las autoridades de la defensa aérea española cuando se les consulta, en segundo término. Para ello, a mediados de junio pasado se dirigió una carta al Mando Aéreo de Combate. En la misiva se preguntaba acerca de la “revelación fotográfica” que se hizo en su día así como la identidad del avión que causó la alarma. 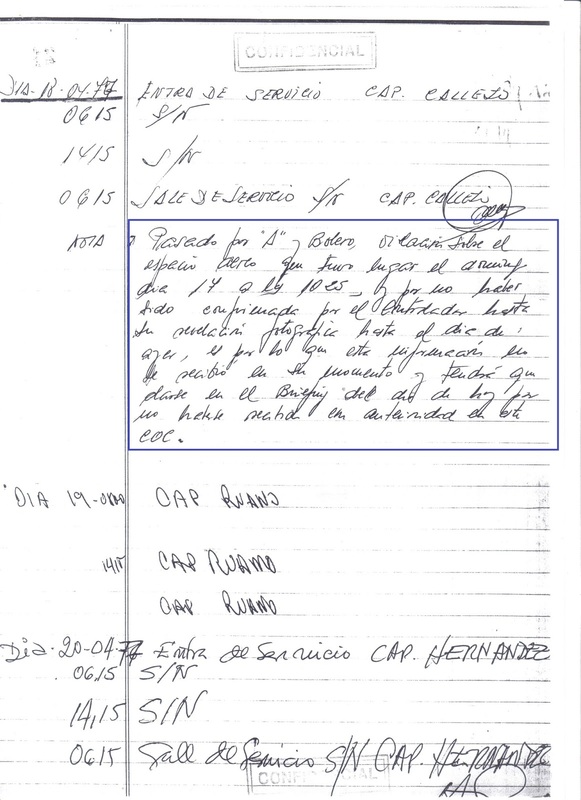 Firmada el 1 de septiembre por el jefe del MACOM y comandante del Mando de Defensa y de Operaciones Aéreas, teniente general Eugenio Ferrer, la respuesta ha sido muy detallada y precisa, informando que no es que se hubieran tomados fotos desde ningún avión (como se podría haber interpretado de la lectura de la breve anotación de los libros) sino que se hicieron simples capturas fotográficas de la pantalla del radar, “dado que en aquel momento no se disponía de un sistema de grabación de datos”. 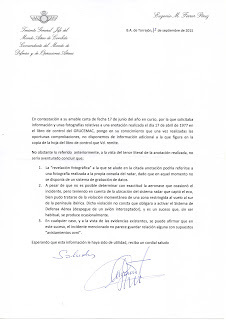 La carta también señala que dada la ubicación del radar que detectó la aeronave intrusa (se trató del EVA-3, “Bolero” en nombre clave, situado en el monte Negrillo, en Constantina, Sevilla), “bien pudo tratarse de la violación momentánea de una zona restringida al vuelo al sur de la península ibérica”. 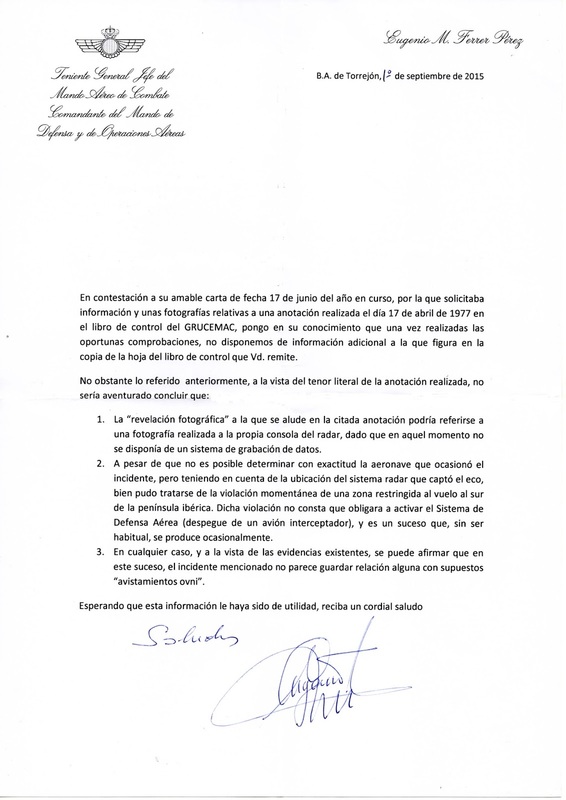 La prolija información del general Ferrer también añade que “no consta que obligara a activar el Sistema de Defensa Aérea (despegue de un avión interceptador)” y que se trata de “un suceso que, sin ser habitual, se produce ocasionalmente”. Finalmente, la minuciosa respuesta concluye: En cualquier caso, y a la vista de las evidencias existentes, se puede afirmar que en este suceso, el incidente mencionado no parece guardar relación alguna con supuestos “avistamientos ovni”. Contestación profesional que es de agradecer y que muestra un actitud dispuesta y colaboradora. A valorar especialmente el hecho de que se respondiera con minuciosidad una consulta que se remonta a hechos nimios ocurridos hace cuarenta años. Invito al lector que haga una comprobación por sí mismo: pregunte en su empresa por una factura insignificante de hace 40 años. Su jefe de Contabilidad le mandará, por lo menos, a paseo. Nada que ver con el tipo de respuesta oficial recibida de los gestores de la seguridad de nuestro espacio aéreo. En la búsqueda de patrones del fenómeno ovni, la relación entre observaciones y densidad de población ha mostrado históricamente resultados contradictorios. Después de más de 40 años de estudios, no hay todavía una conclusión clara sobre si la relación entre el número de informes y la densidad de población es directa o inversa. Hemos analizado algunos de dichos trabajos y hallado la forma de hacerlos reconciliar. Hemos encontrado que existe una relación directa entre el número de avistamientos y la densidad de población; sin embargo, el incremento del número de informes no es proporcional sino sub-lineal con respecto al incremento de población. Desde que en 1966 Jacques Vallee publicara resultados que establecían una relación inversa entre lugares de aterrizaje ovni y densidad de población en Francia, muchos otros trabajos se han llevado a cabo para verificar esos hallazgos y tratar de resolver esta cuestión. ¿Hay más ovnis donde menos gente habita? ¿O se ven más precisamente donde hay más testigos potenciales? Plaza ha realizado una amplia revisión de la literatura internacional al respecto hasta 2014 y la conclusión a la que ha llegado –contraria a los resultados originales– apunta al aumento del número de informes ovni en línea con el aumento del número de habitantes. Pero esta es una relación del tipo sub-lineal, esto es, que está afectada por otros factores que reducen la proporcionalidad. Trabajos como este no solo ilustran el hecho evidente de los datos ovni se pueden estudiar con el método científico sino que, además, resulta esencial disponer de bancos de datos y catálogos, bien organizados y que sean altamente representativos. 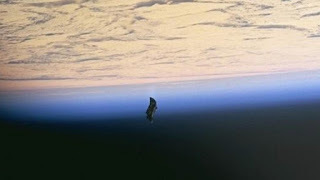 En resumen, se trata de un objeto fotografiado durante la misión del transbordador espacial de la NASA (en inglés: Space Shuttle o Space Transport System), STS-88, que transcurrió del 3 al 15 de diciembre de 1998. Pero no es nada del otro mundo sino simplemente un trozo de recubrimiento aislante de la nave espacial dejado caer accidentalmente por el astronauta Jerry L. Ross durante una actividad extra-vehicular (paseo espacial). Esta pieza, una de las seis que se instalaron en el primer segmento de lo que se convertiría en la futura estación espacial internacional, se quemó en su reentrada días después (fue reemplazada en la siguiente misión). Abajo, vemos al ex-astronauta Ross (izquierda) reunido con Oberg. (4) Argentina y la oleada de 1965. El periodista Guillermo dos Santos Coelho ha escrito un interesante artículo para la edición digital del diario Clarín, con la siguiente entradilla: “Tenía todos los ingredientes. Un escenario exótico, testigos curtidos y un clima de época que avivaba la imaginación, poco antes de la llegada del hombre a la Luna. Por eso, el ovni que se paseó por la Antártida hace 50 años fue un hito que ocupó el primer lugar de las portadas de todos los diarios argentinos. Y disparó una psicosis colectiva que duró todo el invierno y un poco más”. Me ha complacido leer esta nota de un reportero argentino porque confirma una de las tesis que se emanan de nuestro trabajo Avistamientos OVNI en la Antártida en 1965 (http://www.upiar.com/index.cfm?artID=182), que la difusión mediática de esos acontecimientos en el polo sur estimularon una oleada de observaciones de ovnis tan irreales como numerosos. (6) El veterano investigador argentino y astrónomo aficionado Carlos Demaria, rememora en su blog el treinta aniversario de un renombrado avistamiento sobre Buenos Aires el 17 de septiembre de 1985, cuando un objeto no identificado fue visto y fotografiado por incontable público. Demaría enseguida comprobó que se trataba de un globo meteorológico, pero en ese primer momento lejos estaba de saber que se trataba de un sofisticado ingenio de la serie MIR (Montgolfier Infra Rouge) que realizaba experimentos a cuenta del Centro nacional de estudios espaciales (CNES) de Francia. Antonio González Piñero es el bibliógrafo español por excelencia en lo tocante a libros de ovnis y asuntos conexos. 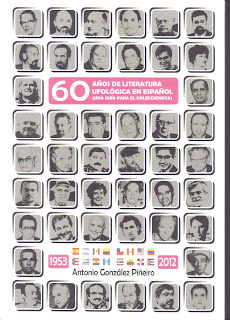 Después de algunas ediciones preliminares, en el año 2005 nos sorprendió con su obra 50 años de literatura ufológica en España, y ahora, diez años más tarde, nos presenta un extraordinario volumen con 344 páginas que no solo cubre toda la bibliografía nacional sino que cualquier libro otro en castellano dedicado al “fenómeno ovni, contactismo, astroarqueología y enigmas extraterrestres”. Se trata de un mayúsculo esfuerzo y un ejemplo de constancia y dedicación que se convierte en una obra de referencia para los estudiosos de estos temas. Mi reconocimiento –y agradecimiento personal– al gallego González Piñeiro. (1) no hay tal cosa como "el fenómeno OVNI”, sino muchos fenómenos que causan ovnis, (2) no hay tal cosa como un "verdadero ovni”, (3) las afirmaciones extraordinarias requieren pruebas extraordinarias, (4) relatos de experiencias ovni forman el núcleo del síndrome, pero las historias no constituyen "evidencia" sino folclore, (5) es la cultura ‒no la experiencia‒ lo que crea la interpretación ovni pero algunas experiencias son independientes de la cultura, (6) el síndrome ovni cumple la papel del “otro” sobrenatural, (7) la hipótesis extraterrestre y otras teorías exóticas no pueden explicar los ovnis, (8) la idea de una superconspiración para ocultar la verdad sobre los ovnis es infalsificable, (9) el denominador común en las historias de ovnis son los seres humanos que ven y creen en ellos, y (10) la gente quiere creer en los ovnis. 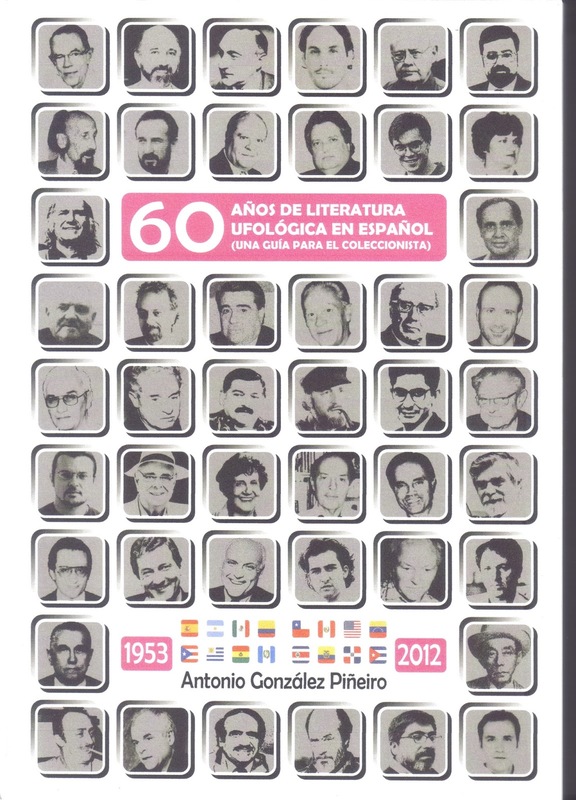 El libro tiene un prefacio y 17 ensayos de 14 autores distintos, ocho de Ucrania, dos de Rusia, tres de Europa (España, Austria y Holanda) y uno de Estados Unidos. El texto está en inglés (siete trabajos) y en ucraniano (diez trabajos), con resúmenes en ambas lenguas. Incluye mi trabajo: “El futuro de la ufología”. Como expresa el título, el libro versa sobre los ovnis en Bélgica y lo hace desde una perspectiva escéptica. Sabido es que las oleadas son una de las propiedades más distintivas de la observación ovni. Una de las oleadas más significativas y mediáticas fue la amplísima oleada de ovnis triángulares sobre Bélgica ocurrida entre los años 1989 y 1992. Esta obra es un estudio en profundidad de los antecedentes, desarrollo y término de una oleada que puede señalar si el incremento de informes fue concomitante a una actividad aérea inusual o bien devino por causas ligadas a los medios de comunicación. Publicado por Lulu en 2015, el libro encara el lado no fantasioso de esta famosa oleada y presenta el trabajo de un grupo de estudiosos escépticos de Francia y Bélgica formado por Jean-Michel Abrassart, Nicolas Gauvrit, Marc Hallet, Renaud Leclet, Roger Paquay y Raoul Robe. Para mí, resulta una lectura recomendable para conocer lo que los críticos sostienen acerca de los aspectos convencionales de esta oleada. (Agradezco a Patrice Seray el envío de un ejemplar). El pasado 7 de junio recibí la visita de Mercedes Pullman, una ucraniana afincada en Madrid con sobradas dotes de empuje para la investigación. Pullman, formada en la antigua Unión Soviética en filología rusa y en España en antropología y en trabajo social, es una persona emprendedora que canaliza su capacidad de organización y coordinación en la creación de INCEA, un portal para promover el estudio de los fenómenos anómalos desde la seriedad. Buena voluntad, la tiene. Facultad para la encuesta, demostrada. Capacidad de comunicación intergeneracional y pluriideológica, también. Le deseo suerte en su empeño.